I don't know how long this will take so you'd better get over there. See the map below. UPDATE: They will begin demolition with the big machines Sunday at 10am, September 1, 2013. There is plenty of "story" behind all this. 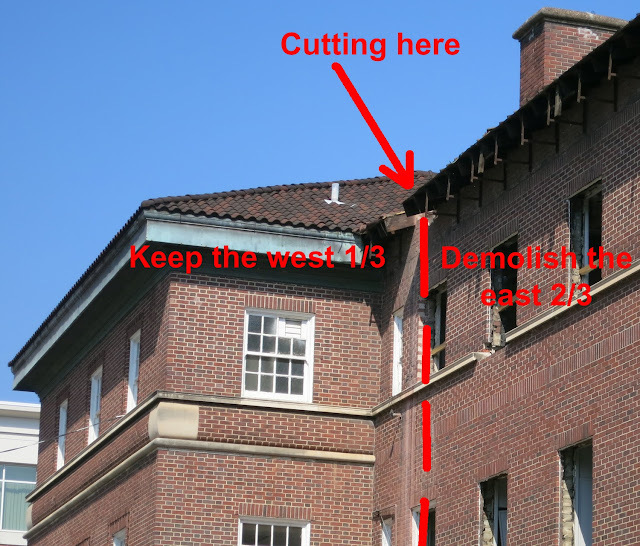 The short of is here: "Advocacy Was Successful But Recourse Has Sealed the Fate Crum & Forster" documentation from the Atlanta Preservation about efforts to save the building intact. They've almost completed the cuts. This the south side, the service side of the building, west to the left, east to the right. The left part stays. The front door faces west, fronts Spring Street. They'll save this part. They are salvaging the roof tile. I presume this is Ludowici roof tile but probably not made in Ludowici, Georgia. Maybe they'll use it in a new building on this property. While it was abandoned, they put up these fake widows. It helped keep squatters out, reduced the fire risk. From a distance it was a good look. Up close it seemed an odd optical illusion. The interiors might have been impressive in 1928. They are removing soffit and fascia. You don't realize how important it is to the design until it's gone. Flemish bond brick work faces the street. How they built it. Looks like bird nest territory. They've got some big saws. The right stays, the left goes. They are protecting the right side, the part they are saving. They'll saw through everything inside and out. They've completed this cut as of today. Go see, you should always go the wake. Make sure to see the front door. They were smiling as if this was the time of their lives, which indeed it was. Joe Dreher told me that he and his son were helping 3ttman with his Living Walls mural in Summerhill, said I should drop by. So on August 8, I dropped by. 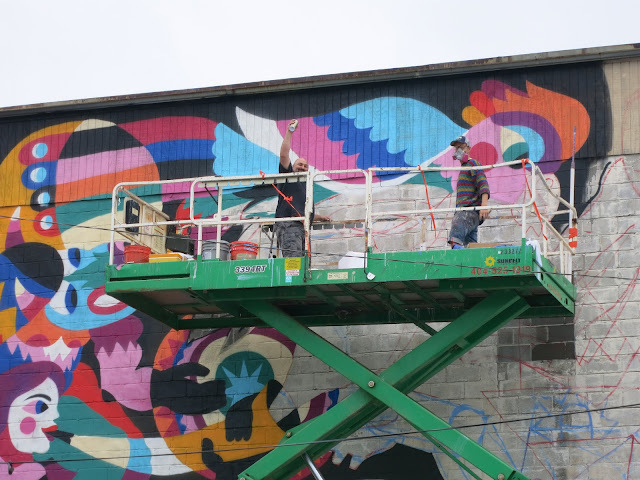 And that started my favorite art experience: For 8 days I watched the murals go up. Left: Joe Dreher. Right: 3ttman, "His name derives from the French trois têtes man, or three headed man – a recurring figure in his work." My first look at 3ttman's wall (right) and 2501's wall (left). 3ttman was on the lift sketching with a long pole. Living Walls volunteers looked after the artists. Here are three: Joe, Vanessa, and Karley. These are the smiles I'm talking about. The butterfly catcher wall by Matt Haffner and Laura Bell dwarfed them. One little paintbrush by Matt Haffner. One little paintbrush by Laura Bell. Freddy Sam took great pains on his Springbok. He painted more that 50 of them all by himself. When I spoke with him on this day, I felt the crushing workload he'd set out for himself. Toward the end of the week I think he relaxed a little. Trek seemed a spec on his giant wall. Artist 2501 brought a loved one and needed all the cool he could get on his south-facing wall. The blue wasn't just the buff for Know Hope. It's his signature color and the majority of the composition. Know Hope was one artist with one little paint brush. The Marcy Starz blue was lighter. I never caught Marcy painting. Her mural advanced in chunks. Tip for summer muralists: Get a north facing wall, chose a design that allows delegation. Sam Parker had help at times. Sam worked alone at times. Tip: A lift puts you at the exact height. A scaffold gives you ladder-legs and requires ungentlemanly bending. Nanook started later and was in a groove that gave him time to chat. Nanook seemed gnat-sized working beside Freddy Sam who by this time was on his third panel of springbok. Pastel and his assistant were there every single time I drove by. He painted the whole building. An overwhelming amount of solo work. You can see Turner Field behind Gyun Hur's whole-house mural. Jaz did two murals, just knocked them out. This is the small one. Horses appeared wherever he sprayed. INTI did the biggest wall. He seemed to enjoy the work and my attention. Agostino dealt with a prickley deodar cedar at Triumph Lofts. When the lift ran out of gas, they ran on battery backup. Roti incorporated a prior mural by Jaz on The Sound Table wall. Roti, one man with a can. At the end Living Walls volunteers broke things down and cleaned things up. I know they were happy, I know they were exhausted. I know they felt an aching regret: the best part was over. In the process they bonded with the artists they might never see again. That's the way I feel and I just watched a little. So the murals will remind me of all the people who put them up. And I'll remember my favorite art experience (so far). Thanks Joe for the great tip. I hope to do it again next year. They're finished now. Go see. They are in perfect condition. 8. Look at them from different vantage points if you can (2501 photographing his wall).